Free and Open to the Public! No registration necessary, and open to ALL community members seeking employment! Employers reserve your booth by clicking the Register link to the right. *There will be extensive radio advertising promoting the event through Entercom Buffalo on WGR and Kiss 98.5 - don't miss this opportunity to connect with local job seekers! 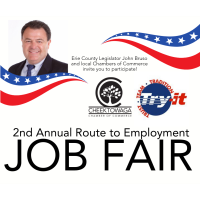 Join Erie County Legislator John Bruso at his 2nd Annual Route to Employment Job Fair with a focus on helping veterans in our community through employment, resources, and benefits. Sponsored by the Cheektowaga and Lancaster Area Chambers of Commerce.